Tis’ the season for giving and receiving. And you can do both at the Crosslake Common Goods Christmas Boutique from 10 am – 6 pm Thursday, November 15th. Enjoy hot cider, cookies and Christmas music while you shop in a winter wonderland! This will also be the first chance to see this year's Christmas tree ball gown design, in addition to brand new Christmas displays throughout the store. 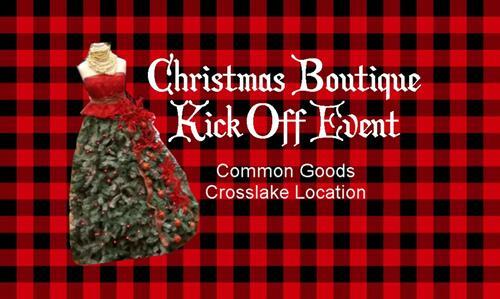 In preparation for the Boutique, the Common Goods location in Crosslake will be closed November 14th. Common Goods is a trendy thrift store for the community-minded shopper, owned by Bridges of Hope. Common Goods offers high-quality goods at reasonable prices, including clothing, fashion accessories, casual and one-of-a-kind home furnishings and unique furniture pieces. Its Crosslake location is at 35562 County Road 16 in Crosslake. Since 2002, Bridges of Hope has served over 26,000 households in the Lakes Area. Program services include Childcare Services, Family Support Services, Mentoring Services, Resource Connection Services, and the new Self-Healing Communities Project. Bridges of Hope’s goals are to prevent child abuse and neglect and to promote stronger, healthier families. Bridges of Hope operates two Common Goods thrift stores: one in Baxter and one in Crosslake. Profits from the stores support Bridges of Hope’s work in the community. For more information, call Common Goods at (218) 692-7682 or visit www.commongoodsmn.org.